May 12, 2011 January 21, 2018 P.O.P. Whether or not you’re an admirer of President Barack Obama, there’s no denying that the man has an uncanny gift that could almost be called an odd superpower: everything he does triggers an avalanche of reactionary hatred that defies all limits of surrealism. EVERYTHING. Even getting born. To be sure, there are always grounds for legitimate criticism of any president. But in the case of this president, virtually all of the legitimate criticism has been leveled by those who voted for him. The slime cranked out by the right-wing rumor mill does not in any way, shape or form qualify as criticism. It’s just nasty, juvenile and utterly deranged, rarely bearing any relevance to his actual job performance – or, for that matter, to anything else on Planet Earth. Birtherism is just one example, and it’s an example that has received far more than its share of exposure from the “liberal” media. President Obama is an American citizen. There is no doubt of that. There has never been any doubt of that. Except in the twisted minds of teabaggers and others of the right-wing fringe, who insist that he couldn’t POSSIBLY have been born in this country, since his father is African, and little Barack spent part of his childhood abroad. But it has absolutely nothing to do with racism, so don’t you even think such a thing. These people apparently even believe that the socialist/ Muslim/ Klingon cartel that installed the guy in office were scheming even 50 years ago that this lowly kid born in Hawaii – oops, Kenya, or Lemuria, or wherever – would someday be their puppet, so they planted a phony birth announcement in two Hawaiian newspapers. After all, that kind of prescience is a snap when you’re working on behalf of The Anti-Christ. And unfortunately, it’s people like this who dominate the public forum in the U.S of A. Consequently, the media are STILL treating this non-issue like a major crisis. If he really thought this would put an end to it, he was inexcusably naive. As soon as I heard the news, I predicted that it would be a matter of days before the appearance of new conspiracy theories declaring that this birth certificate is also fraudulent. But I was wrong. It was a matter of MINUTES. “An OBVIOUS forgery”, they promptly declared. Yes, they did use the word obvious and they did put it in capitals. 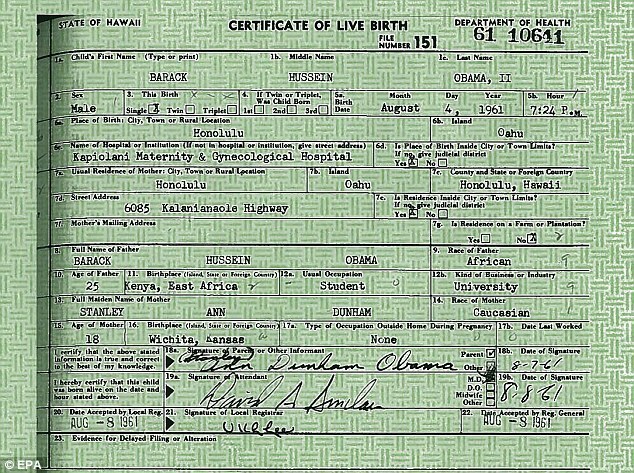 See, according to the birther gospel, the elements of the evil conspiracy who had the foresight to plant phony birth announcements half a century ago know how to fake documents with Photoshop, but it never occurred to them that anyone else out there also might be familiar with Photoshop. And so the birthers began latching onto EVERY DETAIL in the certificate and declaring it to be “suspicious”. These claims are often studies in how incomplete information can be used as powerful propaganda – some of the most effective lies are lies of omission. For example, one detail singled out was that the father’s place of birth was listed as Kenya, East Africa. Aha! Kenya didn’t even exist until three years later. Obvious forgery, right? Nice try. While it’s true that the independent nation now known as the Republic of Kenya did not formally exist until 1964, the former British colony had been called Kenya since at least 1920. Naturally, the media pounced on these inept smears and promptly discredited them. Nah, just kidding. The media, as always, figured there is no attack too sleazy or silly to merit the limelight indefinitely, provided it’s aimed at a Democratic president. Instead of “birthers have enough egg on their faces to feed China”, the headlines said, “birth certificate raises more questions than it answers”. After all, why did the president wait two years to take time out of his schedule to have an official document flown over from Hawaii? It’s not like he had anything better to do like, oh, track down a terrorist mastermind or something. Frankly, your Professor Of Propaganda suspects that the delay may have been a shrewd political ploy to give the birthers plenty of time to thoroughly make asses of themselves.